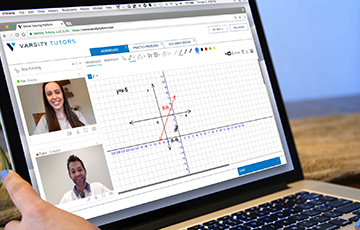 The maximum GMAT score is 800, but the best score is far lower, as MBA Admissions advisor Avi Gordon, explains. 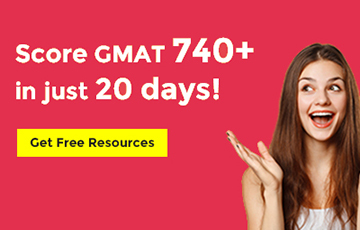 I had a MBA admissions client recently who I'll call Tim, and when Tim and I got talking about his admissions profile he told me he'd scored 720 on the GMAT, and then retaken the test (and scored the same again). I nearly dropped the phone. 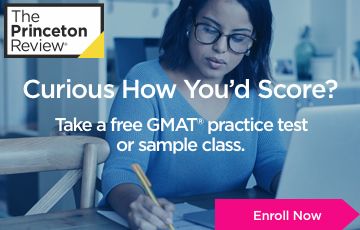 "Why would anyone ever want to retake a 720 GMAT?" I gasped. The truth is, I know why. Candidates think the higher they score, the better their chances of admission. It seems obvious but is it right? Yes, of course the GMAT is crucial. It tells Adcom about an applicant's intellectual and cognitive skills, and is particularly useful in allowing easy comparison across institutions and undergraduate majors, to some extent across cultures. Furthermore, every 10-point gain adds to candidates' admissions prospects, and a move of 30 or so fundamentally changes which b-schools they can legitimately hope to get into. But this is true only up to a certain level, about the 700-740 range. A higher score has diminishing returns and can even - believe it or not - harm one's chances. Why? As I told Tim, there are two reasons. First, although the MBA is a post-graduate university degree, it is primarily professional education. Its fundamental task is to prepare and place people in business management positions, not academic positions. Managers need to be smart but, as everyone knows, the cleverest people don't necessarily make the best managers, nor best entrepreneurs, or bankers, or consultants. Jack Welch, Herb Kelleher, George Soros, Ted Turner, etc., are smart enough. But they are not Einsteins. MBA Adcoms are not looking for brainiacs. The second, related, reason is it takes a mix of talents to get admitted to a competitive school. The operative term here is "mix". Academic ability is just one of many items considered, along with career potential, leadership potential, team player profile, work experience, volunteer experience, profile diversity, and so on. Academic ability is definitely a requirement, but so are many other attributes. This reflects the multifaceted demands of a real business career. 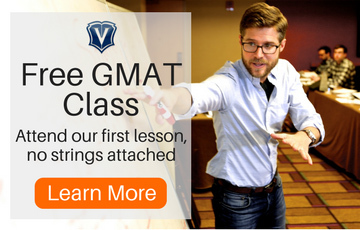 This explains why an ultra-high GMAT can be harmful. Scoring in the super bracket (750 or above) means that you are, by definition, in the 99th percentile. People who score like that are often better pure scientists or philosophers, than managers. It's a stereotype, but the absent-minded professor is commonly associated with being a poor people-person and a poor manager. If you get a very high score, Adcom will be absolutely sure to thoroughly check and almost disbelieve that you are also a leader and team player and can manage adversity and do all the practical things you need to get done in a business day. So, at around the 700 level, a threshold is reached (depending on GPA results and other possible variables) where Adcom can safely put a check mark next to your academic ability, and move on to see what else you offer. 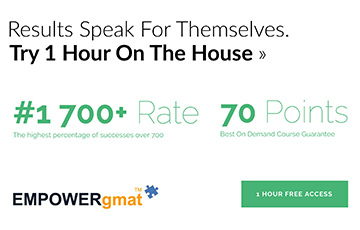 If you are too far below the school's average GMAT, nothing else you are, do, or say will count. But once you hit the threshold, it's pointless to keep knocking in that nail. 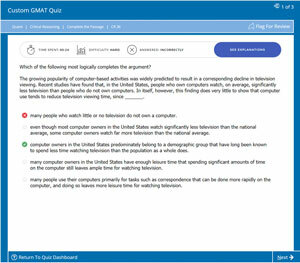 A higher GMAT won't check any other box than "intellectually capable" and chances are it's already checked at 700. A super-score is not going to help you if your references are so-so and your essays are undeveloped. Adcom prefers "balanced good" to "unbalanced excellent." This also explains why there is more malleability in the system than most candidates realize. 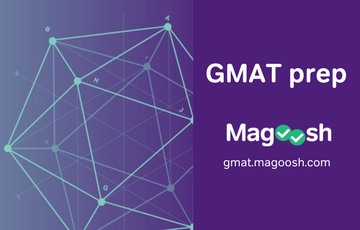 If the rest of your application is good and your undergraduate record is in the right range, you can be up to 40 or 50 points below the school's published GMAT average (providing you are not too lopsidedly in Math or Verbal.) Obviously, the published average means that half of accepted applicant's scores are below that mark. It makes sense to be very concerned with the GMAT until it is within the guidelines of your target program. Then forget about it and spend time on other aspects of your application. A very interesting post. I think I would have to agree. I agree and disagree. On one hand, I always tell my students that if they hit 700 they will have a shot at any top school, and that getting a 700 vs. a 750 will likely not be the deciding factor if they end up getting rejected. That is, a 700 is is almost always good enough as long as the rest of the application is competitive. On the other hand, I'd always trade an 800 for a 750 or a 750 for a 700. The idea that ad comms will penalize you for scoring well is a little silly. Everything else being equal, a higher score is better than a lower score. But Jim the question is not about a higher score, everyone would prefer a higher score, the question is how good is a decision to retake a test once you have crossed the 700 or 720 mark. 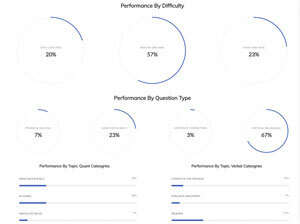 I would definitely question the decsion making ability of anyone who chooses to retake the test once he has crossed the 700 mark, it just shows that he/she is not able to concentrate on the bigger picture and also that they are not able to priortize. While I too do not agree with the idea that a candidate would harm his chances of getting into a good b school by getting a 750 or more, I do think that a candidate who retakes the test after scoring a 720 sort of weakens his application to a certain extent. Maybe ive done too much GMAT practice lately but I read OPs post and immediately think why its illogical. OP: you're confusing correlation with causation. It may well be true that many of the 800-scorers are not well rounded enough to pass the other admission craeteria, perhaps because the same intellectual ability that allows them to score 800 works as a factor against them developing other abilities. That does not mean it is better to have a 750 over an 800. Obviously a higher score is better for each individual, assuming the admission process is objective. HAHAHAHAHAHAHAHA. This is *the most ridiculous* post I have ever read. And at the same time it makes me a little angry that you're actually trying to talk people into not doing "too well". 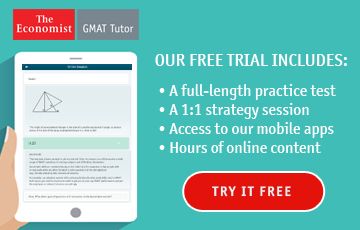 Firstly, the GMAT is by no means a measure of technicaly or abstract academic intelligence. The questions are only a wee bit harder than what 9th graders do. The reasoning and logic is VERY basic - don't believe me? Ask any philosophy professor or lawyer. Secondly, lord help us if any admissions officer is idiotic enough to follow this drivel. There is no such thing as "too intelligent" for profession X. Professors just have different skills from entrepreneurs. Take Sergey Brin or Bill Gates or Warren Buffet. I highly doubt anyone could argue that they are any less intelligent than Paul Krugman (Nobel Prize Winner). Business schools are looking for well-rounded individuals. That certainly does NOT exclude "too intelligent" or "too accomplished in music" or whatever other garbage you come up with. I pity your clients, the fools who actually PAY you. I agree with statement. From myprofessional experience in engineering I have always seen managers are not academically smart, but their smartness in managing activities, communication skill (off this topic) could make them successful. Wow thats so rude. Cant one express his own opinion?!!! I think its a valid point that one should not even think of wasting time to just bump their 7xx score to 7xx +10 or 7xx+30. Its an absolute waste of money and time imo. But i agree when Jim said that he would trade 750 for a 800. 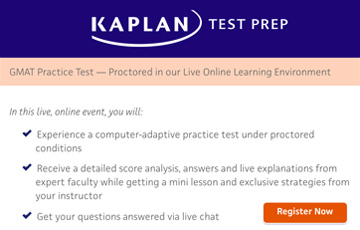 Because he is a GMAT instructor and i'd definitely go to a tutor with 800 score over one who scored 750. But for the purpose of B-school - i think 700 is a very competitive score and if i happen to get that score then there ends my GMAT journey!!! 1) Admitting someone with an 800 can help raise a school's GMAT average which most schools want. 2) For a school with an already elevated GMAT Average like H/W/S, admitting someone with an 800 can allow the school to admit an otherwise attractive candidate who has a 600 or 2 otherwise attractive candidates with 650s and still maintian a 700 average. So it gives the school more flexibility with respect to admitting other candidates. So I can't imagine for a second that getting an 800 is a bad thing. Even if on your first try you got a 750 and retook it and got 800. I can see a problem with getting 720 and retaking it and getting the same score, or worse... coz you look kind of silly or arrogant or both... but even so, you STILL got the 720, right? And if the rest of your app is strong, then why should they penalize you? Basically, If you have an 800 GMAT and are rejected from any school, then it is not because of the 800. I mean that'd be just crazy. It would have to be because your application does not show leadership potential, or one of your referees stabbed you in the back... or something like that. The ivy's are like hot women. They are looking for the best looking and well rounded guys to pick em' up. Now a 750+ is like a guy with six packs and muscles. Two kinds of guys fall in this category. Guys who are genetically prone to have that kind of a body type or guys who just work out to get hot women. The latter part is more common and that is why you have LA fitness and manhattan gmat prep minting the moolah. But I still will not dismiss the 750+ scores. Imagine a woman being picked up by a guy who is not only six packs, 6ft+ tall and her physical types, but also is super smart, leader of men alpha, compassionate and has all the prince charming traits she always dreamed of!!. She will anytime dump that guy without six packs but having other traits!! In other words imagine a guy with an 800 score who is also an excellent manager and an excellent peoples person and well rounded etc etc. Adcom will go horny for such a candidate and dump the 700-730 guys instead!!!! So in general, if you can do your best in all areas of your life and not worry about scoring too much or scoring too low and be outcome independent then fwho cares about or paris hilton or Adcom - YOU ARE THE MAN!!! 200 or 800. It don't matter no more. Now a 750+ is like a guy with six packs and muscles. i love it. so true! Lol - some funny posts up there. Someone PMed me and asked me to give my opinion here. My opinion is entirely anecdotal. My area of expertise is the GMAT, not admissions. Caveat emptor. The general line of thinking above is correct: above a certain level (probably around 720), the score is good enough for the admissions person to say, "Check!" on this particular data point, and then move on to the rest of your application. Getting an even higher score will not get you admitted - that's what the rest of your application is for. Now, theoretically, all things being EXACTLY equal between two candidates, sure, the school would probably pick the one with the higher score. But applications are never exactly equal, right? There are too many fuzzy, qualitative variables floating around. I have not heard of any admissions committee rejecting someone because of a very high score. I did once hear an admissions person express dismay because an already-high-scoring candidate retook the test, but their dismay was centered around this idea: does this person have common sense and the ability to analyze and prioritize appropriately? From the admissions officer's perspective, the candidate (who I think scored around 720) demonstrated a flawed ability to set appropriate priorities in choosing to take the test again. And that concerned the admissions officer (though I'd be willing to bet that the officer probably also picked up some other clues via essays or recommendations that also raised a red flag in this general area - in other words, it wasn't solely the act of taking the test again). Given what I know about how admissions departments tend to use GMAT scores, I would be happy with a 720. Sure, I'd take a higher score if someone wanted to hand it to me, but that's not going to happen - it would take major time and effort, with no guarantees! Instead, I would use my limited, valuable time to (a) try to get a promotion at work, (b) take on a challenging volunteer or other extracurricular activity, (c) develop new professional skills, (d) or... you get the idea. Basically, I'd use that time to try to advance other parts of my application - that time spent (if I accomplish what I want to accomplish) will be much better spent than raising my score to 750. Plus, I have the added bonus that, if I get a promotion but don't get into b-school or decide not to go, I still get the benefit of that promotion. 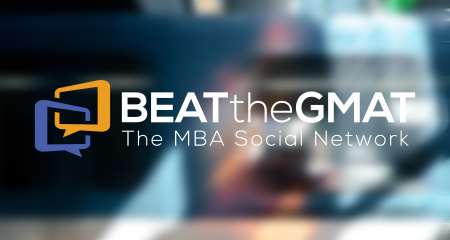 What are you going to do with that 750 GMAT score if you don't go to b-school? Please note: I do not use the Private Messaging system! I will not see any PMs that you send to me!! 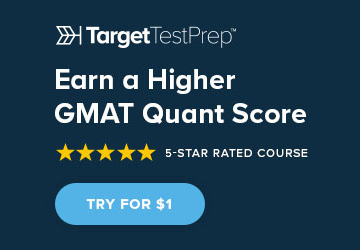 Contributor to Beat The GMAT! It would seem that the only reason someone would criticize you for retaking a 720, is if you scored in the 700-730 range the second time. For example, if I was scoring 750s on my practice tests, and i got a 720 on the real thing. I'm almost definitely retaking the test. Also, if I got a 720, and then studied for two more months, my score SHOULD go up. The problem is, if you get a 720 twice, it either means, that is your absolute ceiling (which isn't something you want to indicate), or you are bad at preparing (probably even worse to indicate). Law Schools, Business Schools, Undergrads...they are all ego-maniacs. Just like they compete over the most valedictorians, most national merit scholars, they want the highest GMAT averages, and the highest LSATs or MCATS. I think there is a big difference between a 720 and a 750. And there is a big difference between a 750 and 780+. That being said, many individuals have very well rounded apps, and don't need the bump. But maybe you are applying to Harvard, and have a 3.3 GPA, which is a little bit below their average. 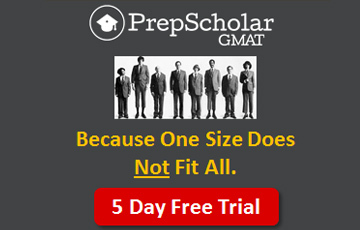 Well, you probably need to score above their GMAT average. It explains why you might want to retake a 720 and aim for a 750.